The first fifteen minutes or so of Béla Tarr's The Man From London [A londoni férfi] is pretty much all you'll need to decide whether what follows is likely to bore or enthrall you. It's slow, devoid of real dialogue, comprised on long and unhurried camera movements, and observes what action there is from a considerable distance. If this is not your first Béla Tarr film then none of this will surprise you, and if your previous experience was a positive one then you can comfortably settle back and let the sounds and images wash over you. If that previous Tarr film didn't float your boat then I'd get out now, as the style and pace hardly varies as the film progresses and is very recognisably the work of the man who gave us Werckmeister Harmonies and the seven-hour plus Sátántangó. 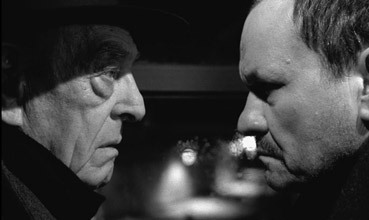 Béla Tarr tends to work in black and white. Indeed, the monochrome image is such a distinctive aspect of his style that the colour Fortissimo Films logo that sits at the front end of the film actually made me jump. He likes to shoot his protagonists from behind as they sit, usually with their shoulders hunched, and favours a lower than eye-level camera position. His camera moves a lot but at a speed that suggests that it's being pulled though cold-weather molasses. If a character leaves the room in a hurry, the camera will follow at its own speed and catch them up when they pause to ponder or put on a coat. Story takes a back seat to atmosphere and intrigue, and locations always feel as important as the casting. Some regard Tarr's work's as carefully crafted empty shells in which the gullible with find their own invented meaning, while for others he's one of the few true masters working in cinema today. Somewhat typically, I guess, I find myself in neither camp. I genuinely do find Tarr's approach to cinema hypnotic, but I also suspect there is sometimes less to the substance than the surface stylistics suggest. But boring? Never. But that's me. Plenty will disagree have very vocally done so – complaints about the slow pace and lack of incident are common, and while I can see where they're coming from I can't share that response. The moment Tarr's camera starts to wander I find myself curiously hooked, my involvement so complete that I really do lose track of the passing of time. The opening scene is a case in point. A ship has arrived in dock and the passengers are disembarking, something observed from a distance through a line of small square windows that the camera peers through as it slowly glides up and down the signal box in which they are located. Eventually the occupant of the box is revealed, whom we later discover is a night-working signalman named Maloin. Like the camera, he is also watching the passengers as they make their way to the train waiting on shore. Is he observing with purpose or just out of curiosity? It's hard to say. Then one man throws a suitcase to the other side of the dock, where it becomes the basis of an argument between two men, one of whom is thrown into the water with the bag in his hands. Unable to rescue the suitcase, the second man departs to a nearby hotel. You might have a picture in your head about how this all this plays out, but every bit of the above is observed in wide shot from the viewpoint of the watching Maloin, interrupted only for one of Tarr's signature back-of-the-head shots of our man. Once the assailant has vanished, Maloin makes his way to the dockside with a boat hook and fishes the bag out of the river. It's packed with English money, which he meticulously dries out. The next morning he heads to the hotel for an end-of-shift drink. What feels like about ten minutes of screen time has actually occupied twenty-five. The following night the assailant, an Englishman named Brown, sets out on a small boat to locate the missing suitcase, and when he is unable to do so he clearly suspects Maloin of grabbing it for himself. Any plans he may have to retrieve it, however, are put on hold by the arrival from England of ageing Inspector Morrison, who gives Brown a rather public talking to that prompts him to immediately flee. Maloin still has the money, but what will he do with it? 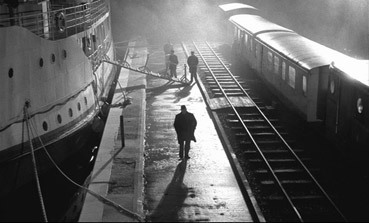 It terms of plot there's not much more to it than that, but it's textured with interesting asides, from Maloin's anger at the at how his withdrawn daughter Henriette is treated at her workplace to the exchanges that take place in the Hotel bar that the signalman frequents. Rhythmic sound and movements pop up throughout the film that invite a reading that I've yet to settle on: a ball kicked against a wall, a butcher chopping meat like a Disney anamatronic, Maloin's anguished activation of levers, the loud ticking of a clock in Maloin's apartment. 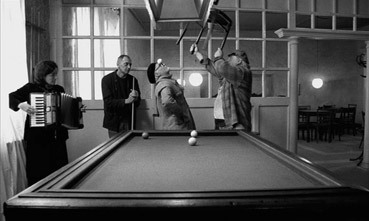 The real hook, as ever with Tarr, is not the story but the handling, particularly Fred Kelemen's mesmerising cinematography, his camera prowling like a watchful predator in manoeuvres of sometimes breathtaking complexity and striking precision, drifting between and around characters and repeatedly settling on faces to watch their reaction as they talk or listen to others. Elsewhere he follows characters in close-up as they walk as if joined to their body (he's not, by the way, but has a world class steadicam operator at his disposal in the shape of Marcus Pohlus, who also worked on The Pianist, Downfall and Perfume: The Story of a Murderer), and even incorporates zooms into the movements without them actually feeling like zooms (as the only camera 'movement' – and I use the term loosely – that we ourselves cannot perform, zooms are notoriously artificial if not executed carefully). This slow dance of camera motion is at times almost organically wedded to Tarr regular Mihály Vig's hauntingly minimalist score, a series of shifting accordion drones that at one extraordinary point undertake a diegetic shift, when the tempo is upped and the musician herself is revealed to be accompanying two old men as they perform a peculiar dance using a snooker ball and a wooden chair. It's a rare comic moment that at least slots more comfortably into the surrounding scenes than the pair of babbling clothiers in the scene that follows, who say more in their couple of minutes of screen time than most do in the rest of the film. Particularly when compared to Tarr's previous films, however, not everything in The Man From London hits the right note, at least for this humble viewer. The plotting is more visible and conventional than usual for the director and feels somehow less suitable for a style that suggests a degree of enigma in everything it observes. And it's hard to shake off the fact that a similar setup was also the basis of the Coen brothers' immaculately crafted No Country for Old Men, as well as a number of other, earlier works, Shallow Grave included, all of which did a lot more with the resulting consequences. A little more damaging is the decision to have the French and English characters played by a primarily Hungarian cast, with the only English actor (the fabulous Tilda Swinton, who figures only briefly here and spends most of her screen time in argument) cast as Maloin's French wife. That in itself is not a major issue – after all, neither Daniel Craig nor Liev Schreiber are Polish but we bought them as such for the sake of the story in Defiance – but the decision to dub all their voices in French certainly is. I'm fully aware that many people prefer dubbing to having to read subtitles, but I've never been one of them. 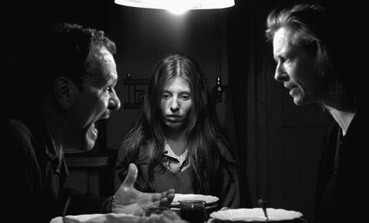 While having to regularly flit your eyes downward to catch a translation may not be ideal, it at least allows you to hear the dialogue as it was intended, with all the inflections and pauses and emotions specific to the performance in question, something that is effectively destroyed by replacing the voice with that of someone who in most cases the director has never even met. And while I always seem to forget I am reading subtitles after ten minutes of any even half decent non-English language film and become as involved in the characters and story and performances as I would in any film in my native tongue, the mismatch of audible words with mouth movements that results from dubbing acts as a constant reminder that I'm watching an artificial construct, and complete involvement is nigh-on impossible. Worse than that, the considerable differences in the wording and sentence structure of languages mean that a spoken English translation will often not match the equivalent French, Italian or Chinese, resulting in unnatural pauses and wording, and dialogue that is altered from the original to fit. Obviously the actors performing the various dubs in The Man From London, whoever they may be, were working under Tarr's direction, but the other complaints made above still hold true and are emphasised by the decision to focus on the faces of speaking characters during long monologues. The story may demand a port location that is directly accessible from England, but with an almost all-Hungarian cast I can't really see why Tarr didn't just shoot the film in his and his actors' native language. The voice replacement may be true to the locale in which it is set, but it repeatedly bursts the dense atmosphere bubble that the camera, character movement, facial expression and music have worked so hard to create. All of which inflicts a rather annoying dent on The Man From London's otherwise compelling sheen. The Tarr devout will no doubt dismiss such complaints and I've already seen a couple of claims that the dubbing in some way adds positively to the film's sense of strangeness, but I'm not buying it. This shouldn't stop you from seeing what is still a compellingly executed work or from marvelling at Tarr's way with atmosphere, character, and the harmony of music and imagery. Even if you ignore the above, a sizeable portion of any potential audience are still likely to be exasperated by the film's ultra-slow pacing and lack of tonal variance, while those with a bug up their behind about foreign language films can get twice as annoyed at one that is both subtitled and dubbed. But if you're tuned to Tarr's unique and often hypnotic style, then you'll likely live with these missteps and appreciate the film for what it does right. This I'm certainly able to do, but would hope that Tarr's next venture sees him more comfortably back on home turf. Framed in the director's standard 1.66:1, unlike Artificial Eye's other releases of his work the transfer here is anamorphically enhanced. The results are generally pleasing, although it does appear crisper on close-ups than some of the wider shots, and black levels do grey out a little in some of the night time exteriors. The tonal range otherwise copes well with the sometimes almost noir-like use of black and white, while the lack of shadow detail in places is likely to have been a deliberate artistic choice. Upscaling to my HD plasma introduced a lot of blocky artefacts in places, but this is likely to vary with player and TV. The soundtrack is Dolby stereo 2.0 only, but a good one who clarity and bass levels (the former most discernable on water splashes, the latter on the grind of machinery or transport) are better than some 5.1 tracks I've listened to in recent years. Reviewing the work of any director who has been elevated to the auteur pantheon is always tricky, particularly when you find yourself parked between the extremes of reaction their work provokes. It's this very dilemma of seeing both sides of the argument that saw me endlessly re-writing a review of the BFI's Blu-ray release of Pasolini's Salo, or the 120 Days of Sodom that I was ultimately unable to complete because the whole thing mutated into an overlong debate on the pitfalls of auteurism. You won't have to look far to find polarised opinions on Tarr and particularly this film, from those who dismiss it as pretentious rubbish and suggest that everyone who finds merit in it (i.e. anyone who doesn't share their opinion) is deluded, to those who believe that everything a genius like Tarr even breathes on is brilliant by default, and if you can't see that then you're not a proper film fan. I do believe that Tarr is a filmmaker of enormous talent and that technically The Man From London is sometimes astonishing, but am not convinced it has quite the depth and substance that some have claimed, or that the dubbing issue was anything more than an artistic faux pas. Even a genius can make one, after all.